If you’re searching for journal prompts for women, we’ve got exactly what you need. Whether you’re looking for journaling prompts for self discovery, journal prompts for moms, or just some basic journal topics for adults to get your creativity juices flowing, we have 90 (yes, NINETY!) ideas to inspire you. As a full-time blogger and freelance writer, I spend a lot of time writing my thoughts out for all the world to read, and while I don’t always love the topics I write about, my career very rarely feels like ‘work’ to me. I plan my editorial calendar 3 months ahead of time, which means I have a defined list of topics and keywords at my disposal at all times so that each time I sit down at this computer, the only thing I need to do is WRITE. Of course, some days are better than others, and I go through periods where I feel extremely motivated and inspired, while other times I really struggle to stay focused. But regardless of how I’m feeling, I force myself to keep at it. I write at least 3 times a week, and on the days I’m not researching for an upcoming project or snapping photos for my Instagram feed, I often find myself drafting future blog posts in my mind. Writing has always been therapeutic to me, and while I try my hardest to ensure the content I share on Meraki Lane has some sort of personality attached to it rather than just spitting out great tips that will make you look and feel your best, the reality is that my site doesn’t really lend itself to sharing intimate details of my life. So I’ve been dabbling into the world of journaling over the last few months, and I find it’s helping to bridge the gap between my professional and personal life. There are so many benefits of journaling, and with so many different freestyle and guided journals to choose from, I find it’s gaining tremendous popularity, particularly with women. …Provides an outlet. It helps us express ourselves and our feelings without worrying about offending or upsetting someone else. …Promotes a sense of calm. Writing our thoughts and feelings out on paper helps us come to terms with the things we’re struggling with, helping us find our way back to a state of calm. …Provides us with solutions. There are tons of daily journal prompts for women that are designed to help us think outside our comfort zones and find solutions to our problems. …Provides perspective. Journaling offers a deeper glimpse into our minds and helps us understand why we react to things the way we do. …Keeps us accountable. Whether you’re working towards a specific goal (weight loss) or something a little broader (happiness), tracking your habits, working through the obstacles you encounter, and formulating plans to reach your goals through journal writing will have a positive impact on your success. …Identifies triggers and patterns. Keeping a written log of your moods and feelings can help you identify certain trends over time. The trick is to write it all down and reflect back on your journal entries periodically to see what insights you can gain. If you need help letting the stresses of life roll of your back, but struggle with the seriousness of journaling and mindfulness, this guided journal is for you. It’s equal parts hilarious and cathartic, and the exercises help keep you accountable and learn how to let go without feeling guilty. This guided journal is pretty self-explanatory – you’re meant to write a sentence (or two) about your day every day for a year, and then go back to the beginning of the journal and start again at the beginning of the following year, with the exercise continuing for 5 years. The idea is to have a place to get your most important thoughts or feelings down on paper (the things you’re most thankful for, something meaningful that happened, a profound emotion you are experiencing, etc. ), and then look back over time to see how you have changed/grown. There’s also a One Line a Day for Moms version, where you can specifically focus on your memories as a mom. This journal is all about self-reflection, and through different writing prompts, activities, and inspirational quotes, you will begin to see the good in yourself, making it the perfect guided journal for those struggling with self-confidence. If you’re a list writer (like me! ), this is another great guided journal. It contains 52 writing prompts for women (and men) that guide you through creating a weekly list of positivity, which you can add to daily. It’s perfect for those who are trying to practice mindfulness and gratitude, and it can be a fabulous self-discovery tool. Described as a ‘toothbrush for the mind’, The Five Minute Journal is great for beginners as it doesn’t take a lot of time to complete, but helps you get into the habit of carving out time each day to jot your thoughts on paper. The Five-Minute Journal is unique in that it designed to train our brains to begin and end each day with feelings of happiness and positivity. The Five-Minute Journal is also available for kids, so you can purchase a set for the entire family and make it a ritual you complete together at the start and end of each day. This guided journal doubles as a great keepsake for kids. The journal prompts within the book will encourage you to share stories about your own childhood experiences, which will not only help you reflect on the good (and sometimes bad) parts of your past and how you’d like those to shape the way you raise your own children, but it will also serve as a fabulous autobiography to give to your children when they are older. 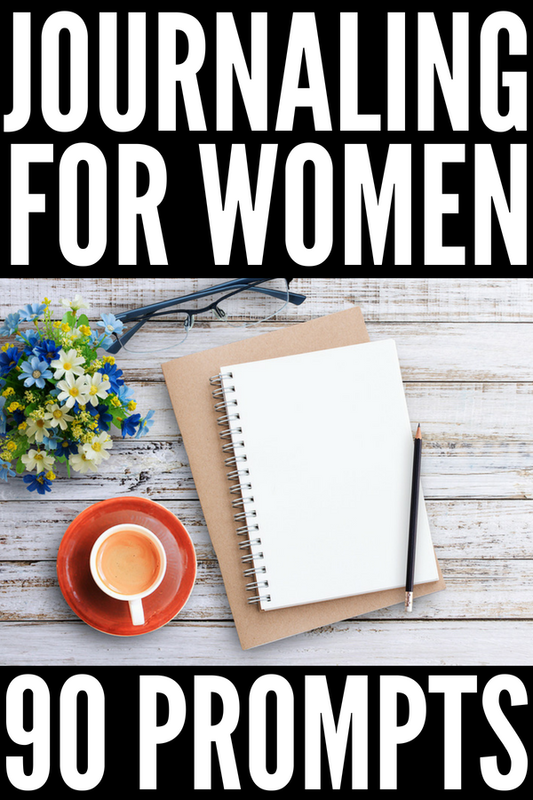 If free writing is something you’re interested in pursuing, and you’re looking for journal prompts for women to get you started, we have 90 ideas to keep you inspired below. 1. Write a list of 5 things you love about yourself, and why they make you unique. 2. If you could be the best in the world at one thing, what would you choose and why? 3. When you were little what did you want to be when you grew up, and did you follow through with your dream? 4. What quote inspires you on tough days? 5. If you could live anywhere in the world, where would you choose and why? 6. If you won $1 million, what would you do with the money? 8. If you could have lunch with one person who is no longer here with us, who would you choose and what one question would you ask them? 9. What’s the biggest life lesson you’ve ever learned and how has it changed you? 10. Describe a situation in your life that caused you to feel regret. If you could go back in time, what would you do differently? 11. Write about a book/movie that had a big impact on your life, and why it affected you so much. 12. What 3 things do you want the people you love the most to remember about you after you’re gone? 13. Fill in the blank: When I’m feeling anxious or stressed, I ___________. 14. Describe something GOOD that happened to you today. 15. What’s the most embarrassing thing that’s ever happened to you? 17. Discuss a time you failed at something important to you. If you could have a do-over, what would you change about the situation? 18. What are you most grateful for in your life? 19. Pick ONE positive word you’d like to focus on this week and brainstorm a list of things you can do to experience this feeling each day. 20. Describe your favorite time of year. What do you love about it, who do you spend it with, and what activities do you enjoy during that time? 21. Write a letter to someone who has done you wrong. Discuss what they did and how it made you feel, and then forgive them and let it go. 22. If you had $1,000 to spend on nobody but yourself, what would you buy and why? 23. If you could change one thing about yourself, what would it be and why? 24. What is your favorite childhood memory? 25. Describe your perfect day. 26. What qualities are important to you in a friendship/romantic relationship? 27. List and describe the most important people in your life, and what you admire most about them. 28. If you had one full day to yourself without any responsibilities, who would you choose to spend it with and what would you do? 29. Discuss 3 things you’d like to change in your life, and brainstorm strategies to make these changes a reality. 30. Describe your dream job. 1. What 3 things do you love most about yourself, and why? 2. Write a letter to your teenage self telling her all the things you wish she knew. 3. Make a list of things that are holding you back from your wants, needs, goals, and desires. Be brutally honest with yourself, and brainstorm ways to overcome these obstacles. 4. If you could travel to any destination in the world, where would you go and why? 5. Describe a situation in which you helped someone else. What did you do? How did it make them feel? How did it make you feel? 6. How would you describe yourself to a stranger? 8. What are your top 5 values in life? 9. What does self-care mean to you, and how can you incorporate it into your daily routine? 10. Describe a time in your life when you failed. What did you learn from it? 11. What are your best character traits? 12. What is something nobody knows about you? Why have you kept it a secret? 13. What does your ideal life look like? 14. Write about an important person in your life who you are grateful for. What do you admire about this person, why have they had such an impact on your life, and what would you like to tell them? 15. What is your biggest fear, and what about it makes you feel scared? 16. What makes you feel fulfilled? 17. If you could spend an entire day with one person, who would you choose to spend it with and what would you do together? 18. When something good or bad happens, who is the first person you want to tell, and why? 19. Discuss 5 things you wish others knew about you. 20. What is your biggest regret in life, and if you could go back in time, what would you change about the situation? 21. What quote or saying inspires you when you need it most? 22. Look at yourself in the mirror and then write out 3-5 physical traits you love about yourself, and why. 23. What do you want people to remember most about you when you’re gone? 25. Who is your mentor, why do you look up to him/her, and what has he/she taught you? 26. What is your 5-year plan? Map out all of the things you need to do to reach your goals. 27. Do you have any unhealthy habits that are holding you back from your goals? How can you overcome them? 28. What is the biggest life lesson you’ve learned to date? Describe how the lesson was learned, and how it has impacted your life. 29. What is the best piece of advice you’ve ever been given, and why did it have such an impact on you? 30. Create a bucket list of things you’d like to accomplish or experience in the next 12 months. 1. Discuss 3 things you do well as a mom. 2. What is your favorite time of day with your children? 3. If you could have an entire day to yourself with no responsibilities, who would you want to spend the day with and what would you choose to do together? 4. What is the best parenting advice you’ve ever received? 5. What shocked you most about motherhood? 6. What parts of motherhood do you find the most fulfilling? 7. What is your most challenging time of day with your kids? Brainstorm 3-5 strategies you can start TODAY to make this time easier. 8. Write a bucket list of things you’d like to experience with your children over the next 12 months, and schedule them into your calendar to keep yourself accountable. 9. What qualities do you look for in a ‘mom friend’? 10. Describe your biggest achievement as a mom. How did it make you feel? 11. When your kids look back on their childhood, what 3 things do you hope they remember most? 12. What’s the silliest thing your child has ever done/said? 13. What scares you most about being a mom? 14. Write a letter to your pre-mom self telling her all the things you wish she knew. 15. How has your mom shaped you as a mother? 16. What are your favorite family traditions? 17. Discuss a time you felt you failed a mother. If you could have a do-over, what would you change about the situation? 18. What makes you feel fulfilled? 19. Describe 5+ things about your child(ren) that make you proud. 20. Write about your experience with childbirth and how it changed you. 21. How has your relationship with your spouse changed since you became a mom? 22. What are your least favorite parts about being a mom, and how can you improve them? 23. What does self-care mean to you now that you’re a mom? 24. What do you wish other people understood about your specific experiences with motherhood? 25. Write a letter to your children to open on their 18th birthday. 26. What parts of motherhood are you most grateful for? 27. How have your priorities changed since you became a mom? 28. What parts of motherhood do you take for granted? 29. Is there anything you miss about your pre-mom life? 30. If you could change ONE thing about yourself as a mom, what would you change and why? Whether you just graduated from high school, are in the throes of your undergraduate degree, just gave birth to your first child, have school-aged kids, or are enjoying retirement, journaling provides an uncensored outlet for you to write down your thoughts and feelings freely, allowing you to gain clarity and control over your emotions and better understand who you are as a person. I hope these journal prompts for women prove useful to you. Remember to be consistent and uncensored, and to keep at it! If you found this collection of journal prompts for women useful, please share this post on Pinterest! And if you’re looking for more health-related tips and tricks, please follow our Health board where we share all kinds of great ideas to keep you inspired to be your best self!